Over the past decade, cell phone usage has increased amongst adults with 78% of Canadian households having active mobile phone accounts (Statistics Canada, 2011). The increasing rise of cell phone use makes it a promising method for aspects of health care delivery. Mobile communications or mHealth use affords new ways for health care professionals to provide health care, inviting change in the way health services are usually implemented (Kaminski, 2011; United Nations Foundation and Vodafone Foundation, 2009). Mobile communications has the potential to transform health care delivery and requires vision directed under transformational leadership for successful implementation. In order to strategize this transformation, leaders can be guided by the use of Lewin’s change theory. For the purpose of this paper, we have developed a hypothetical scenario that advocates the implementation of mobile communications in the delivery of health care. We use this scenario to evaluate literature on mHealth, and argue that this form of technology can be effective in delivering health care. In addition, we offer information on transformational leadership and on Lewin’s change theory. This provides guidance about how administrators can explore the leadership style and change processes required to integrate these technological advancements into practice. The Canadian Nurses Association (2009) and the Canadian Federation of Nurses Union (2006) advocate that quality health care occurs as a result of communication and collaboration between health care providers and their patients.. Current and emerging technologies enable levels of collaboration beyond traditional methods of health care delivery. Consequently, the literature makes a strong connection between effective health care delivery and mobile communications. Mobile communication technologies provide alternate ways to exchange information, collaborate with health care professionals, influence health outcomes and affect the processes of care (Hodder & Frazer, 2012; Krishna, Boren, & Balas, 2009). Mobile phones, combine phone access, text messaging, convenient Internet access, and other apps that enable health care professionals to provide health related interventions and disease management support to their patients from a distance (Krishna et al., 2009). Technology advances such as mHealth, or mobile Health, can create change in the way that health care services are traditionally conducted. Thus, stakeholders, health administrators, and leaders should consider embracing these changes. Although the technological advancements of cell phones have the potential of providing a successful method of health care delivery, many health care institutions ban cell phone inhibit or even ban their use by employees. The purpose of writing this paper is to gain insight on how mobile communications can be used in health care and to offer a process by which health care leaders can reconsider the use of mHealth. We evaluate cell phone usage amongst health care professionals and offer a process to implement change in a growing world of technological innovations. This paper provides a description of a hypothetical scenario which provides a real life example to illustrate mHealth in action and how to apply the change process to incorporate mobile communications into health care. This paper also provides: a literature review of mHealth with a focus on cell phone use; a comparison of mHealth versus eHealth; a description of mHealth applications; and a discussion on transformational leadership and Lewin’s change theory in the context of adopting mHealth into practice. A committee at an institution in an urban area in Canada is in the process of reviewing their personal cellular telephone use policy. Although the policy is aimed at personal cell phone use, it also restricts the usage of mobile technology in the administration of health care. The committee has concerns about the current cell phone usage policy, and is in the process of compiling evidence to submit a report to institutional administrators tot challenge the current policy. The report outlines the benefits of cell phones as tools that can enhance the delivery of health care. The committee included a review of the literature on cell phone usage within the delivery of health care as part of this report. One of the challenges for health care professionals and patients living in this urban area in Canada is that residents and communities are geographically dispersed. Also, unpredictable weather presents a potential access and delivery challenges for both patients and health care professionals. Thus, health care accessibility can be problematic for individuals living in this area. The use of mobile communications – including technology such as cell phones and personal digital assistants (PDAs) – offers a solution since it has the potential to improve accessibility to health services and provides health-related information to rural communities and hard-to-reach-individuals (United Nations Foundation and Vodafone Foundation, 2009). A literature search was initiated using the CINAHL and MEDLINE (PubMed) databases (Pravikoff, Levy, & Tanner, 2011). Search keywords or concepts used included “cell phone”, “wireless communication” or “mobile communication” combined with “health care delivery wireless communications” AND rural OR remote; AND patient care to locate recent research on cell phone use, restricted to within the last ten years. Approximately three hundred references in the English language were identified and reviewed. Most of the results about cell phone use in the delivery of health care were distributed equally between qualitative and quantitative research. A report authored by the United Nations Foundation and Vodafone Foundation (2009) provided evidence of the use of mobile communications in developed countries. Another anecdotal or commentary report on cell phone use suggested that restrictions on the use of cellular phones in hospitals are impractical and that guidelines should be put in place to integrate this technology in the delivery of health (Flynn-Makic, VonRueden, Rauen, & Chadwick, 2011). The literature review explored the meaning of cell phone use under the umbrella of mHealth, the comparison of mHealth versus eHealth, and a description of mHealth applications. The United Nations and Vodafone Foundations (2009) defined mHealth as the use of mobile communications, which includes technology such as mobile phones or cell phones, and personal digital assistants (PDAs). PDAs are small hand held devices that, like mobile phones, allow the retrieval and transmission of data via the internet, and the storage of information (Allen, Bakrim, Lacy, Boyd, & Armstrong, 2011). Mobile devices can be used to access health information, to collect data, to collaborate with health care professionals, and gain interactive support from friends, family, and health providers (Allen et al., 2011; Klasnja & Pratt, 2012). With mHealth technologies, health interventions can be offered by professionals at a decreased cost while continuing to improve the health status of individuals and groups seeking health care (United Nations Foundation and Vodafone Foundation, 2009; Guy et al., 2012). Mobile phones offer an effective and efficient method of enhancing health care. The increase in cell phone use across populations provides accessible tools for delivering health interventions (Klasnja & Pratt, 2012). Individuals tend to have their cell phones on them at all times, thus could have access to health care delivery systems in a convenient and accessible manner (Klasnja & Pratt, 2012). Furthermore, the special features that are enabled through mobile technology, such as personal settings, privacy protection, and the ability to download specific health applications (or apps), create an innovative way to monitor health, to collect data on various medical conditions and diseases, to complete research, provide education, and provide alternate ways to connect with professionals about health (United Nations Foundation and Vodafone Foundation, 2009; Allen et al., 2011; Klasnja & Pratt, 2012). 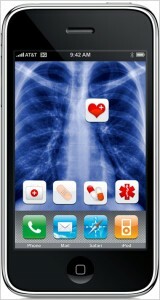 To recap, mHealth deals with the mobile technologies through which health care can be delivered. eHealth, or electronic Health, is defined as “[u]sing information and communication technology (ICT) such as computers, mobile phones, and satellite communications – for health services and information” (United Nations Foundation and Vodafone Foundation, 2009, p. 8). Both mHealth and eHealth are concerned with improving health care accessibility and health outcomes through the use of technology (United Nations Foundation and Vodafone Foundation, 2009). In particular, eHealth is related to point of care (POC) technology and involves the development of electronic health records for patients receiving care within a health care system (Quinn, 2011). POC technologies create ways to ease documentation and increase its accuracy (Quinn, 2011). The electronic health record (EHR) is one form of eHealth that works to improve clinical processes and quality of care, it offers efficient methods for information sharing amongst professionals, and potentially decreases the rate of medical errors (Quinn, 2011). Other forms of eHealth include telehealth and health information technology (HIT). Telehealth consists of telephone consultations that offer remote medical advice between a patient and a provider, and can be used for collaboration between health care providers (Franc et al., 2011). HIT consists of specific software and computer programs that health care organizations implement to engage in electronic administrative and clinical functions (McHugh, 2011). For example, a computer system called Meditech is used by many organizations. eHealth and mHealth technologies are linked since mHealth creates opportunities for health care professionals to access and collect data that otherwise would be impossible (United Nations Foundation and Vodafone Foundation, 2009). mHealth provides various applications that are beneficial to both recipients and providers of health care services. The literature provides support for the benefits of mHealth, and points to its diverse functions. These functions include: sending short message service (SMS) reminders to patients about upcoming appointments; influencing health behaviors as a result of provider-patient intervention via mobile phones; offering education and awareness via the internet on a PDA or phone; and the capability to track data on illness symptoms and disease (Boland, 2007; Fjeldsoe, Marshall, & Miller, 2009; Krishna et al., 2009; United Nations Foundation and Vodafone Foundation, 2009; Ehrenreich, Righter, Rocke, Dixon, & Himelhoch, 2011; Guy et al., 2012). The application of short message service (SMS), or texting, has been successful in increasing the clinical attendance of patients with their health care provider. Thus, when patients see their providers as scheduled, health care is not financially burdened with. In addition, patients are attending to their individual health issues; nonattendance at outpatient clinics has been linked to adverse health outcomes. As well, SMS can offer administrators a cost effective method of providing reminders that are automatic, thereby decreasing the human labour cost of paying personnel to place telephone reminders (Guy et al., 2012). Research evidence also suggests that SMS facilitates health interventions by offering education and awareness for both those receiving care and those administering it ((Boland, 2007; Fjeldsoe et al., 2009; Krishna et al., 2009; United Nations Foundation and Vodafone Foundation, 2009; Ehrenreich et al., 2011). SMS offers an avenue through which health care providers can monitor chronic conditions such as diabetes, asthma, and mental health disorders, such as anxiety, and a means to offer health-promoting advice to their patients (Boland, 2007; Fjeldsoe et al., 2009; Krishna et al., 2009; Ehrenreich et al., 2011). SMS enables telephone-based counseling that influences health behaviors and outcomes (Ehrenreich et al., 2011). For example, smoking cessation programs and glucose control in diabetics have been linked to the SMS ability to provide health intervention from remote locations (Fjeldsoe et al., 2009; Ehrenreich et al., 2011; United Nations Foundation and Vodafone Foundation, 2009). For health care providers, SMS enables data collection technology to track patient’s progress and symptoms (Krishna et al., 2009; & United Nations Foundation and Vodafone Foundation, 2009). SMS also offers an interactive tool for health care providers in hard to reach places, to consult with other professionals and to pursue continuing education through online learning (United Nations Foundation and Vodafone Foundation, 2009). MHealth enables the opportunity to offer health services in unique and effective ways. These technological advancements invite change in the way health care is accessed, offered, and delivered. Therefore, in order to implement mHealth technology in health care, administrators must be open and ready for change. Transformational leadership and Lewin’s change theory can guide health care professionals and administrators to embrace mHealth. Patients are the central focus and priority in the provision of health care service. If patients are to receive effective, efficient care, health care provision must be properly organized and the professionals involved must be open to the changes that technological advances invite (Lemin, 1978; Kaminski, 2000). In his book, Lemin (1978) illustrates a triangulation relationship whereby interactions between multidisciplinary professionals are dependent on patient requirements. In this schema, the patient is at the top of the triangle, and is simultaneously connected to the physician and the nurse via the sides of the triangle. Caregivers, lab technicians, engineers, accountants, physiotherapists, occupational therapists, and other pertinent health care professionals intercept the triangle sides. As technology becomes a part of the health care system, one can argue that mHealth has a role within this Lemin’s triangulation relationship. Roles of leaders and managers are imperative in successfully processing patients and in addressing patient needs. Lemin’s illustration demonstrates that patients are the focus of care and that other members of the health care sector enable the health process. Today, evidence suggests that mHealth also enables this process. For favorable patient outcomes, the health care system requires management with a transformational leadership style that embraces the vision of mHealth as a process in the delivery of care. Transformational leadership considers the relationship between a leader and his/her followers in the context of the organizational culture. To clearly define what is meant by transformational leadership, it is necessary to consider transactional leadership. Marriner-Tomey (1993) wrote that “transactional leadership occurs when a leader initiates a relationship with followers based on exchange” (p. 22). A desirable behavior is acquired from the follower as a result of being motivated by the leader in exchange for some valuable resource. In transformational leadership, an engagement process occurs whereby leaders and followers assume motivational and ethical aspirations (Marriner-Tomey, 1993). Currently, some organizations restrict the use of mobile phones, thereby placing limitations on new ways that can improve “access to patient information, complete legible clinical documentation, and timely and accurate patient data at point of service” (Wise, 2011, p. 38). Mobile devices can be used by health professionals to organize data, access information in a timely manner, and utilize interoperability functions that help numerous health care providers to work with information at the same time (Charters & Guberski, 2011). In addition, mobile devices can be used to download application tools that apply to clinical practices such as calendars, calculators, education on health diseases and services, and access to professional up-to-date literature on best – care practices (Charters & Guberski, 2011; & Kaminski, 2000). The current fiscal and human resource challenges in health care support the need for a transformational model of leadership (Marriner-Tomey, 1993). Subsequently, advancements in technology such as mHealth offer ways to deliver health care in a cost effective but efficient manner (Kaminski, 2000). Furthermore, “[i]t is up to the leaders to make these change initiatives tangible rather than abstract and to awaken enthusiasm and ownership of the proposed changes within the corporate milieu” (Kaminski, 2000, p. 2). Transformational leader characteristics include proactive and visionary traits, and the ability to lead and adapt to technological changes in the delivery of health care (Marriner-tomey, 1993; Kaminski, 2000; & United Nations Foundation and Vodafone Foundation, 2009). The theoretical underpinnings of Lewin’s change theory offers guidance on how to implement change and adapt mHealth to health care. Lewin’s change theory offers a method that leaders can use to implement change within health care systems (Kaminski, 2011). In his theory, Lewin offers an operational framework that explains human behavior resistance to change and provides a solution to adapt technology into health care delivery and its services (Kaminski, 2000; Bozak, 2003; & Kaminski, 2011). His operational framework involves working through three stages: the unfreezing, moving to a new level, and refreezing stages (Bozak, 2003; & Kaminski, 2011). Using Lewin’s change theory can help administrators review their current cell phone usage policy and incorporate guidelines that work towards the integration of mobile technology in the work place setting. First, it is important that leaders recognize there is a need for change (Kaminski, 2000; Kaminski, 2011). Flynn-Makic et al. (2011) articulated that “[h]ospital policies that ban use of cellular phone devices are not only impractical to enforce, they also exclude a key tool that is used as a vital source of information for health care providers” (p.56). Given that technology advancements are inevitable, health care administrators need to embrace the change that it offers. If administrators do not want mobile phones to be used in the clinical setting for personal use, guidelines should be developed that enable clinicians to still use mobile technology for clinical applications. Policies that outline cell phone use restrictions produce a sense of discontent and frustration in employees. We live in a technological era and use technology to connect with the world. This trend could and should apply to health care as well. Thus, a new organizational culture surrounding the trend of implementing cell phone use in health care must begin in the unfreezing stage of Lewin’s change theory if administrators are going to adjust this policy. The preceding literature review was presented to influence driving forces and convince health care administrators to reconsider restrictive cell phone use policies (Bozak, 2003). In this stage, it is important to identify both the driving and restraining forces that support or impede the desired change. The driving forces in this instance include better access to information, thereby the ability to offer better care (Charters & Guberski, 2011). If organizations do not provide explicit rationale for enforcing the restrictions, the validity of cell phone use policies are likely to be questioned by employees. Lewin’s change theory outlines that both driving and restraining forces should be honestly and openly discussed and compared during this stage of the change process (Bozak, 2003). Otherwise, moving forward to the next stage would be futile. Administrators should be invited to discuss their perceptions of current cell phone use policies and weigh the pros and cons of policy change. Once administrators have accepted that the review of this policy is necessary, stakeholders can move towards changing policies to ones that support the integration of mobile communications. Hopefully administrators will understand the benefits that mobile technology add to the delivery of health care. mHealth is a tool and a resource for rural health care providers and many of its applications have its place in caring for individuals, families, and communities in any geographic setting. Mobile technology is a promising method to care for people in hard to reach areas, consult other health care providers, and access online education. After considering the benefits of mHealth applications, organizational leaders might not only review their cell phone policy but also consider piloting a project to implement a specific application offered by mHealth – for example, SMS reminders for outpatient clinic appointments. Once administrators have renewed their organizational culture around mobile technologies, they can develop new guidelines to integrate permission to use these tools for clinical purposes. It is true that “[t]he very culture of an organization needs to be reshaped to properly support the new process introduced” (Kaminski, 2000, p. 2). The development of new cell phone use policies prepares employees to use their mobile phones for direct health care applications (Kaminski, 2011). In this stage, it is important that unit managers and clinical leaders, such as the patient care coordinators, support mobile technology in the work place (Bozak, 2003), thus, creating a new norm for the way in which health care organizations provide services. Two examples of this improved services include: a) permitting critical care nurses to use their smart phones to look up drug compatibilities rather than having to leave the patient’s bedside and look at a chart in the medication room, or b) allowing an English speaking nurse to communicate with a French speaking patient with the help of a language conversion application downloaded on their phone. This allows nurses to become leaders in embracing mHealth, and offering a different avenue to deliver health care, and improve the quality of health services. In Canada, there is much literature that supports eHealth, but a deficiency in discussions and research about mHealth. For example, the Pan-Canadian Change Management Network consists of several key groups collaborating about integrating technology within the Canadian health care system (Hodder & Frazer, 2012). However, much of the literature examining mHealth comes from the United States. The Canadian government places priorities on information communication technology (ICT) which produces advanced health care services such as telehealth, the development of electronic health care records, and the accessibility of online education (Nagle, Hannah, & Hammell, 2011). To our benefit, Canada is moving forward with ICT initiatives – but eHealth initiatives are expensive. Given that Canadian health care is a publicly funded privilege, it is challenging for government to financially fund these technological advances and put them into practice. On the other hand, mHealth deals with mobile technologies that are purchased by individuals. This could be advantageous to health care administration since employees could use their personal cell phones for work purposes. Of course for legal and ethical reasons, this would have to occur within a policy-driven collaboration between the health care employee and employer. With this agreement, health care institutions could trial mHealth and analyze the pros and cons within their own organization. Furthermore, research could be completed to collect data examining the cost efficiencies of mHealth in Canada. Since the United States delivers health care under a fee-for-service regime, US researchers and leaders are interested in saving money in order to profit in a privatized health sector. Still, in a publicly funded system, it makes sense that the Canadian government invest in ways to save money also. Therefore, mHealth may be an avenue to save funds yet improve care, and health authorities may be the first to investigate its cost saving benefits. Change is inevitable and with new advancements in technology, industries are going to have to learn to deal with change if they are going to succeed in reaching organizational goals. Health care organizations are no exception, and administrators must create a culture that invites change. Technology advances such as mHealth offer new ways of delivering health care that benefit both recipients and providers of care. As a result, health outcomes are more favorable. Thus, health care administrators must learn to embrace mHealth since the changes that it offers improve the service provided. A small step taken to revise restrictive cell phone policies is a big step in the right direction of embracing mHealth. Allen, P. E., Bakrim, K., Lacy, D., Boyd, E., & Armstrong, M. L. (2011). Chapter 37: Initiation and management of accessible, effective online learning. In V. K. Saba, & K. A. McCormick (Eds. ), Essentials of nursing informatics (5th ed., pp. 545-557). New York, NY: McGraw-Hill. Charters, K. G., & Guberski, T. D. (2011). Chapter 10: Mobile computing platforms. In V. K. Saba, & K. A. McCormick (Eds. ), Essentials of nursing informatics (5th ed., pp. 157-167). New York, NY: McGraw-Hill. Lemin, B. (1978). . In First line nursing management . England, United Kingdom: Focal Press. Marriner-tomey, A. (1993). . In Transformational leadership in nursing. St.Louis, MO: Mosby. McHugh, M. L. (2011). Chapter 4: Computer system basics. In V. K. Saba, & K. A. McCormick (Eds. ), Essentials of Nursing Informatics (5th ed., pp. 47-76). New York, NY: McGraw-Hill. Nagle, L. M., Hannah, K. J., & Hammell, N. (2011). Chapter 45: Nursing informatics in Canada. In V. K. Saba, & K. A. McCormick (Eds. ), Essentials of nursing informatics (5th ed., pp. 685-696). New York, NY: McGraw-Hill. Pravikoff, D. S., Levy, J., & Tanner, A. (2011). Chapter 44: information literary and computerized information resources. In V. K. Saba, & K. A. McCormick (Eds. ), Essentials of nursing informatics (5th ed., pp. 663-682). New York, NY: McGraw-Hill. Quinn, S. J. (2011). Chapter 33: Overview of post acute services. In V. K. Saba, & K. A. McCormick (Eds. ), Essentials of nursing informatics (5th ed., pp. 487-498). New York, NY: McGraw-Hill. Wise, P. B. (2011). Chapter 3: Electronic health records from a historical perspective. In V. K. Saba, & K. A. McCormick (Eds. ), Essentials of nursing informatics (5th ed., pp. 31-43). New York, NY: McGraw-Hill. Carla gradated with her bachelor of nursing in 2001. Since graduating, she has worked in an adult critical care setting for most of her nursing career. Carla is completing her Masters in Nursing on a part-time basis while she works full time. Her interests in nursing include quality of work life environments which enhance nurses’ life and the patients they care for. Dr. Young completed her PhD training in the Department of Health Policy, Management and Evaluation, University of Toronto and a CHSRF/CIHR Post Doctoral Fellowship at the University of Toronto and York University. Her research focuses on what makes for healthy aging in the community, and on reducing the effects of common age-related chronic diseases such as diabetes, and cardiac disease. Currently, she holds a Canada Research Chair in Healthy Aging at Memorial University of Newfoundland.